We know all pugs love their food and saying no to that adorable face looking up at you is hard. But what if I could tell you that you could give some extra treats without piling on the weight? It’s all about choosing the right treats and how often you should give them. And that is what I am sharing with you today, 7 of the best treats for your pug and how often you can feed them. You cannot go past feeding your pug fresh vegetables as a treat and the best part of feeding fresh veggies is that there are very few calories in them meaning you can feed some extra sneaky treats without your pug gaining the wait to go with it. Dicing up fresh veggies and putting them in treat dispensing toys will keep your pug entertained, exercised physically and mentally as well as full on nutritious foods. 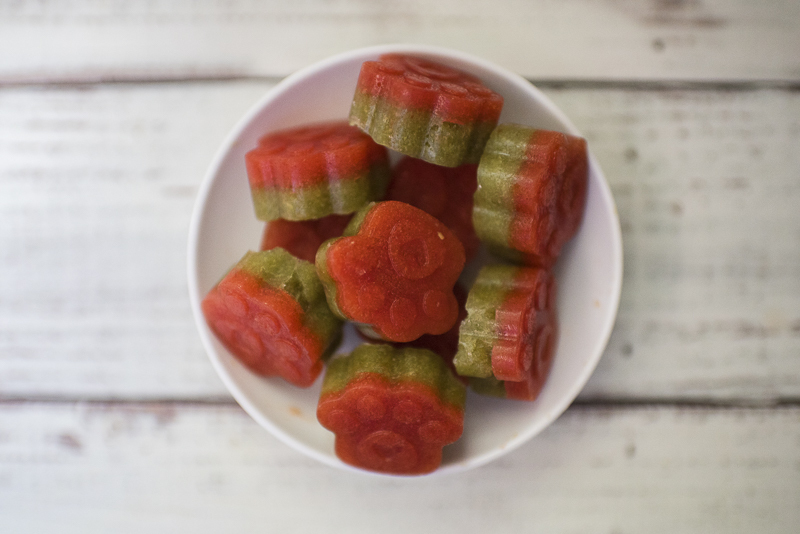 You can also puree some veggies and freeze them in moulds making them the perfect treat on a hot day. Just remember to choose vegetables that are safe for dogs as not all veggies are dog friendly. Say yes to: carrots, capsicum, cucumber, green beans, zucchini and even more. Say no to: onion, corn, potato, uncooked pumpkin & sweet potato. How often: fresh veggies from the yes category can be fed as treats daily. Fresh fruits are always good to feed your pug. Once again, there are some fruits that you need to stay away from and others that are great to feed regularly whilst others are occasional feeds as a lot of fruits are naturally high in sugar. And too much sugar is not good for your pugs health and definitely their waist line. The great things with some of the yes fruits like berries is you can pick them up frozen and have them ready to feed as a treat defrosted or frozen on a hot day. Say yes to: Blueberries, strawberries, blackberries, raspberries, apple (core removed), bananas, and watermelon. 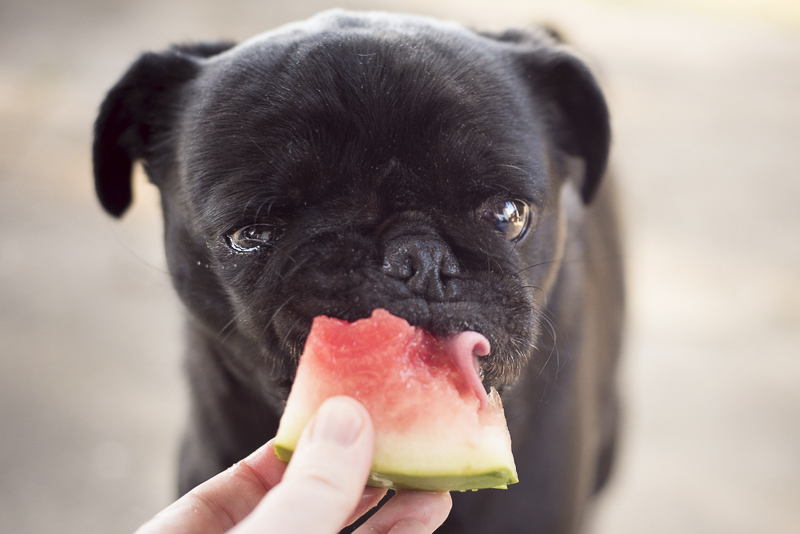 Check out these fruits your pug will love! Say no to: cherries, citrus fruits, grapes and tomatoes. How often: berries are great to feed everyday as they are the lowest in sugar for fruits. All other fruits should be occasional fruits and in small amounts. We already know that coconut oil is a great food to add to your pug’s diet but rather than add it to your pugs meal, you could put the recommended daily serve onto a spoon and enjoy watching them indulge in a health delicious treat. It is also a great way to get those adorable tongue out photos or video when they indulge in a spoonful of deliciousness. How often: to reap the benefits of coconut oil, feed 1tsp per 10kg every day. I love fresh fruit and vegetables but another great way to feed fruit and vegetable treats is dehydrating them. You can pick up dehydrators at reasonable prices so you can make dehydrated fruits and vegetables at home. Whilst they are time consuming to dehydrate, you know exactly what is in these treats and they are delicious enough that you’ll want to eat them too. Say yes to: pumpkin, Apple, carrot, banana, zucchini and any other fruit or vegetable that is safe to feed dogs. Say no to: all vegetables on the no list. How often: It is ok to feed everyday when you choose the right vegetables like pumpkin, carrot and zucchini. Avoid potato and sweet potato regularly as they are high in unnecessary carbohydrates. I am new to dehydrating any food but the great thing about dehydrating your own meat as treats is that you know exactly what you are giving them. And your pug will go crazy for them cause what dog doesn’t like the taste of meat. Try making bite size dehydrated meat treats for small snacks and long twisted meats as chews. Liver is also great to dehydrate for treats. 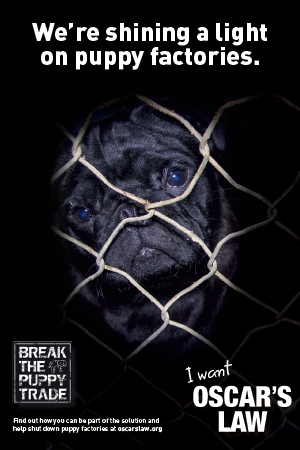 Say yes to: any meat that your pug likes. Choose lean cuts like kangaroo and venison to have lower fat options. Cheaper cuts like chicken are great to turn into chews that are somewhat like bully sticks. Just try to get as much fat off the meat as possible before dehydrating. And dehydrate them a long as possible so there is no moisture left in them as they will then need to be stored in the fridge and won’t last as long. How often: dehydrated meat is ok to feed duly but remember they are higher in calories than fruit and vegetables so work these treats into your pugs daily food allowance. Not all store bought treats are made equal or healthy. The best possible store bought treats are the ones that contain single ingredients like dehydrated liver and meats. But be sure to check the ingredient label as you want it to have one ingredient only so there is no added sugar, salt or preservatives along with all the other bad stuff. 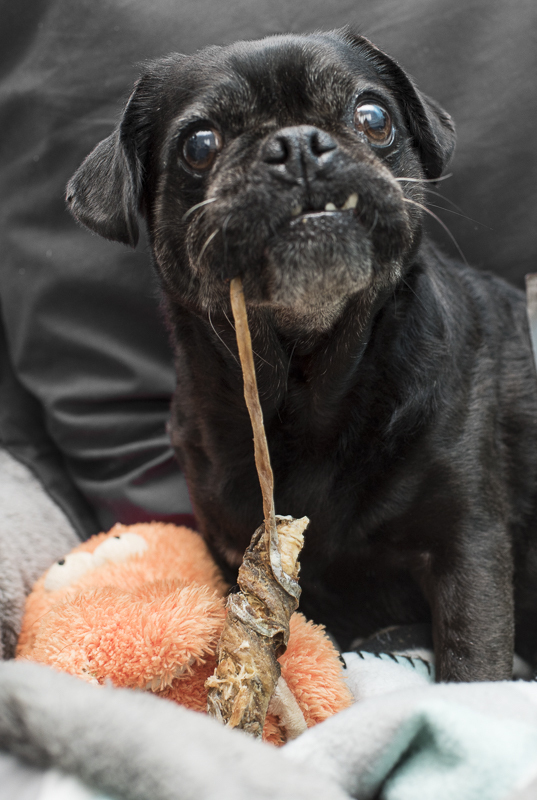 Say yes to: single ingredient treats such as dehydrated liver, kangaroo, venison, beef, chicken and any other meat or fish treats your pug will love. Say no to: any treat made in China or contains more than one ingredient. 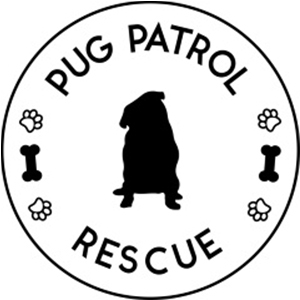 How often: it is safer to make your own treats but as long as you choose the right ones, you can feed daily in small amounts and included in your pugs daily food allowance. Now this is for those who don’t have time to make treats for their pug and still want them best treats for them. There are many great small businesses out there who make their own treats using only the best human grade ingredients. These will include anything from pupcakes to biscuits of all shapes and sizes as well as yogurt and carob based treats. These can be fun and delicious treats to have on hand. Say yes to: any small business that makes these treats at home and list all of the ingredients. Say no to: treats that contain added sugar, salt and other preservatives. How often: keep these kinds of treats that contain multiple ingredients to occasional treats and in small amounts. It definitely shouldn’t be a staple of the diet. Special occasions like birthday, Easter and Christmas are times that these treats are great. Choosing the right treats for your pug is never easy. But with so many great healthy options, you are bound to find several that your pug will love. 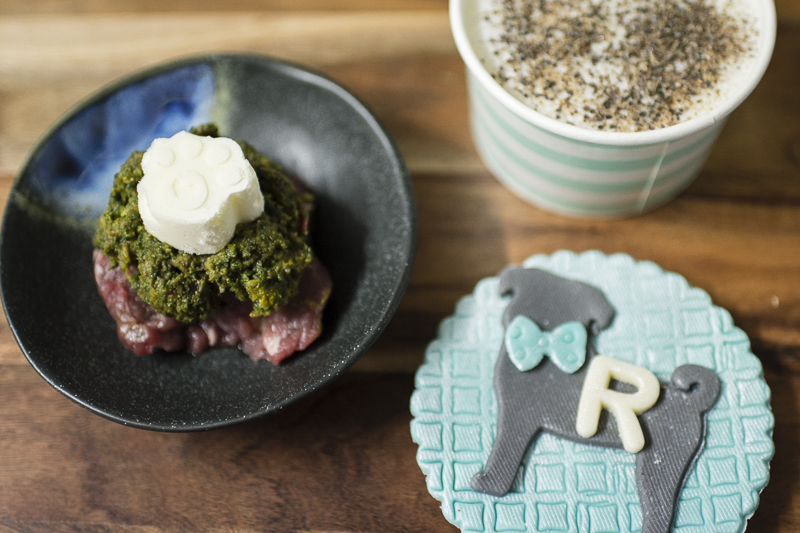 Choose any of these 7 of the best treats for your pug and you won’t go wrong. Have fun making your own and get creative too. Three things our pugs love are dehydrated hot dogs, pug tuna biscuits, and dehydrated banana chips. All of them are easy to make and don’t add too much to the weekly food bill!